Damage to roofs of homes under flight paths is not uncommon and many incidents happen each year. This time a house in Old Windsor was affected, by a vortex created by a plane using Heathrow, with a number of tiles sucked off the roof leaving holes, open to the elements. The damage is done by a vortex of air, which is churned up by the plane passing overhead, and then descends to ground level. Heathrow Airport said “Only one in 10,000 flights results in a vortex” (well, they mean results in a vortex that causes damage to property). Heathrow sent out a team to fix it promptly – airports are always keen to do this, to limit negative publicity from the incident. This house is the home of a grandmother, who naturally was very alarmed and frightened by the incident, which the first though was a large explosion. Luckily nobody was hurt this time by falling tiles or debris. Some living under flight paths, where there is often vortex damage, fear that in due course there will be injuries. 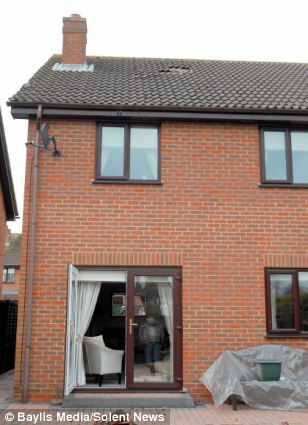 Holes were ripped into the roof of a woman’s house after an aircraft landing at Heathrow created a vortex. The sudden current of air was powerful enough to blow tiles and masonry from the home of Patricia Hills in Old Windsor, Berkshire. BAA, which operates Heathrow Airport, says only one in 10,000 flights results in a vortex. A repair team was sent out to fix the damage at Mrs Hills’ property following the incident on Wednesday evening. Old Windsor is under the Heathrow flight path. 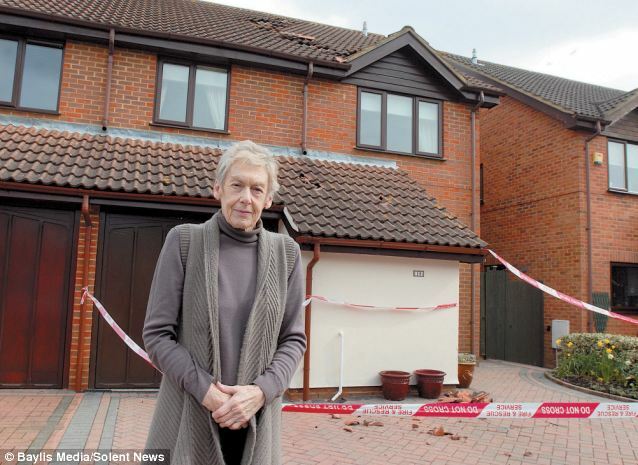 Mrs Hills first knew of the damage when she heard “a large explosion”. The grandmother said: “I was in the kitchen preparing dinner at the time when I heard the noise. “I was alarmed to step out the front door and see a large hole in the roof. “Moments later, a neighbour came out and alerted me to another hole round the back of the house. Firefighters arrived within moments, sealing off the area and evacuating the house in case any further debris fell from the roof. BAA Heathrow spokesperson Lizzie Bysshe said the airport funds a £15m Vortex Protection Scheme for homes under the airport’s flight path. A team of its engineers has completed remedial repairs, reinforcing the damaged parts of the roof. 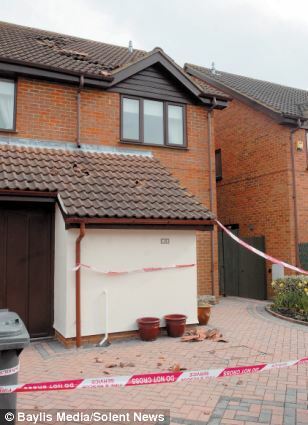 Damage to roof in Florsheim, Germany 3.4.2013 read more …..
Damage to house in Old Windsor 22.3.2013 read more …..
Belfast residents call for independent inquiry into yet another roof tiles incident 6.6.2010 read more ….. I was hit by roof tile dislodged by jet, claims Belfast resident 10.6.2010 read more …..
Damage at George Best Belfast City airport 13.9.2009 read more …..
Damage at Birmingham airport over several years read more …..
Damage in Germany 13.11.2009 read more …..
Damage in Thailand 6.10.2006 read more …..
Heathrow Airport today promised to repair a widow’s house after a passing jet created a rare and powerful ‘vortex’ that blasted tiles off of her roof. Grandmother-of-four Patricia Hills was left with three large holes – with shattered tiles thrown as far as 20ft away from her home. Some even smashed the headlights and dented the front of a neighbour’s car. Mrs Hills, who is in her seventies, said the ‘vortex’ gust left the scene outside her home looking like a ‘warzone’. She now fears for her safety at the house in Old Windsor, Berkshire – which is under Heathrow’s flightpath. Describing the incident – which happened at about 6pm – the retired concert pianist said: ‘I heard this huge explosion and thought it was a clap of thunder. They also put up a cordon around the front of the house to keep people safe. Neighbour Peter Green said: ‘Our houses are semi-detached so I must have been about 15 yards away from where it happened. Mr Green – who is himself an airline pilot – initially thought the damage had been caused by ice from an incoming plane. That is a gust of swirling air that can follow an aircraft and in rare instances cause this sort of damage. A spokesman for BAA said an assessor had been to Mrs Hills’ house and the company will now send men around to replace her damaged roof. It is not known which plane was responsible or at what height it was flying. Wingtip vortices are rotating air left behind by a wing as it generates lift. Their intensity or strength depends on aircraft’s size, speed and whether it has its flaps or landing gear down. They cause ‘wake turbulence’ for other aircraft and, in rare cases, can damage buildings. Posted: Saturday, March 23rd, 2013. Filed in General News, News about Airports, Recent News.